The first hero that I remember having was Duncan Edwards, the Manchester United footballer who was killed along with many others in the team in the Munich air crash of 1958. The second was Yuri Gagarin. 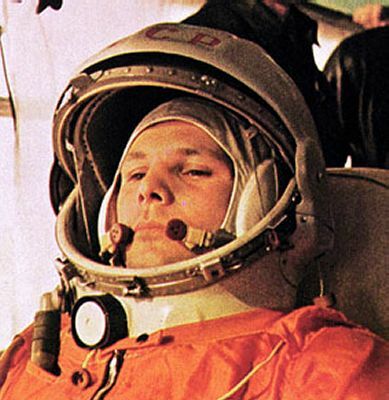 Fifty-seven years ago last Thursday, Yuri Gagarin entered history as the first human being in space. A few years earlier, just before my 8th birthday, my father had taken the time to get me interested in the Soviet Union’s feat in putting Sputnik into space. I was entranced and remained an avid follower of the space race for decades. I followed the Russian dogs going up, and Gagarin’s flight was the obvious next step. It wasn’t revealed for forty years that the cosmonaut ejected from the capsule before it crash-landed, parachuting to earth. And it was definitely sad for Gagarin that he was thereafter too valuable to put at threat and so he was never allowed to return to orbit. No matter. That first flight was a glorious triumph for mankind! This entry was posted on Sunday, April 15th, 2018 at 7:42 am and is filed under Uncategorized. You can follow any responses to this entry through the RSS 2.0 feed. You can leave a response, or trackback from your own site.